Can your smartphone lead to wrinkles? HomeAll PostsBeautyCan your smartphone lead to wrinkles? We are now Smartphones addicts and although there is still a big debate as to whether the ‘smart’ in smartphones has made us more dumber than the latter. It seems that there is yet more to that little device we are all so in love with than meets the eye. 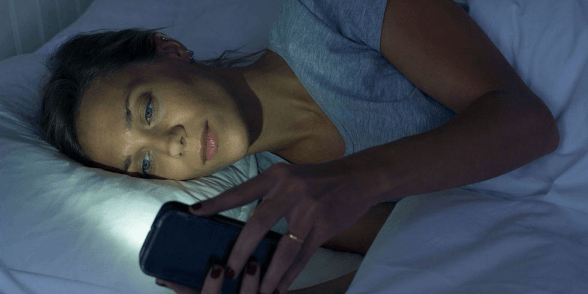 According to new research the blue light, also known as HEV light which is emitted from your phone could be playing a vital role in causing premature ageing. So what exactly is HEV light? HEV light is short for high energy visible light which appears blue in colour and is pretty close to UV light on the electromagnetic spectrum, meaning it is equally as damaging to the skin as it can be to other elements such as our eyes. You are exposed to this light from the sun’s rays as well as everyday gadgets such as smartphones, laptops, iPads and computer screens. A 2010 study suggests that this wavelength of light can penetrate into the deeper layers of the skin, making it potentially even more invasive. The consequences include premature ageing, wrinkling, and pigmentation of the skin. It’s pretty obvious that we aren’t going to rid of our smartphones any time soon, however, there are a few things we can do to protect our skin. Here, the lead skincare developer at glo skin beauty, Amanda Von Dem Hagen explains how we can protect ourselves from ageing through our phones. The best thing you can do is to apply a high SPF everyday, as just like with UV rays, HEV light can damage the natural processes of the skin, causing premature ageing to occur. Many women assume that you only need and SPF cream when heading out into the sun, but actually it can protect you from many different life elements, with HEV light being one of them. 2. Limit your screen time It may be worth taking a little digital detox to try and limit your screen time, using SPF will help protect your skin, but ultimately if you can limit using your usage, this will help your skin to regenerate and take a break from the light. It’s not just HEV light than can cause premature ageing, frowning or creasing your face up to look at something small can have a huge effect on your skin and can promote premature ageing through these muscle movements. The best way to stop this is to ensure you use your phone indoors, or in a place where you can see it clearly. Many people who use their phone in daylight end up frowning as they can’t see the screen properly. 2 little ingredients that will go a long way in your skincare are Vitamin C and Hyaluronic Acid. Vitamin C is an essential ingredient as it helps to stimulate collagen production, which keeps skin tight and plump to prevent wrinkles. Ensuring you have a regular daytime and night-time skin routine is paramount to protecting your skin against screens. Using a serum which is high in hyaluronic acid will help to re-plump and regenerate the skin. You should also ensure you are double cleansing and using a really good night cream so your skin can restore overnight before you start a new day.